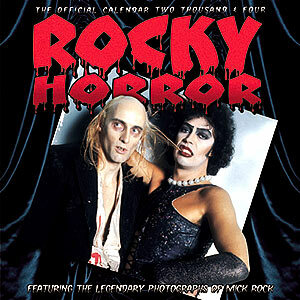 From Slow Dazzle Worldwide, based in the UK, comes the Rocky Horror Official Calendar Two Thousand & Four "Featuring the legendary photographs of Mick Rock". If you bought a copy of the 2004 calendar, you will have an idea of the presentation of this one. The 2004 calendar is presented the same way with the 12" x 12" (30cm x 30cm) page folding out to show the images two thirds of the height of a double page (24" x 12"), with the calendar section below. The calendar is also punched with a small hole to hang it on a nail. This time around, rather than some additional small black and white images, the images either side of the month heading are the same on each page, a shot of Janet in floor show pose with one image reversed to face the other. Pity we couldn't have had some more candid images as featured in the 2004 calendar. My favourite shot is the big group shot of all the Transylvanians with Frank, Riff, Magenta and Columbia (August). Selling Price around £9.99. This item will be added to the Members merchandise section. There is also a link at the bottom of the page to buy direct from Calendar Mart. It is also very nice to see that the company will once again be donating a portion of the proceeds of each sale to Manchester Children's Hospital on behalf of Richard O'Brien. All images copyright Mick Rock/Slowdazzle 2004. Used for purpose of this review only and may not be copied or used on other sites.